Reasons for preparing another uprising of the Macedonians were many. Not satisfied from the decision of the Berlin congress, by which Macedonia still stayed, territorially in the Ottoman (Turkish) empire. The people were poor because the Ottoman empire was in economic and financial depth, raised the taxes they were paying. Some of the taxes they were taking three before it should. From another side the population was robbed by thief's, albanian gangs, who murdered a lot of people. But in this period in eastern Macedonia there was activity of uprising movements. Then the local dukes (ajduts): Dimitrija Pop Georgiev Berovski, Gorgija Pulevski, Dedo Iljo Maleševski, and others, were establishing small detachments (cheta). Beside this inside-political reasons to prepare an uprising in eastern Macedonia, there is another outside factor. That's the fact that Russian troops stayed in Kustendil and Gorna Dzumaja (Blagoevgrad) and the Serbian troops in Vranje. The Macedonians thought that if they start an uprising they would take part and help them. 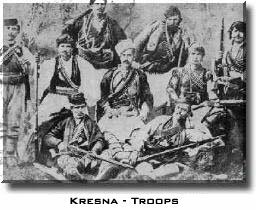 The Kresna uprising started in October 1878. In the early morning the few troops leaded by Dimitrija Pop Georgiev Berovski, Stojan Karastoilov and others attacked the Ottoman property in the village of Kresna, Pirin Macedonia. Because the first attack was in Kresna, the uprising got called Kresna uprising, beside in the documents was mentioned as Macedonian uprising. Then the uprisers, who were at least 400 took to prison the a lot of Turks. Soon they liberated many villages, around 35, from the both sides of the river Struma. The region of which the uprising was active got bigger. With the success at first the uprisers took the city of Banjsko and the village of Razlovci. The Kresna Uprising had one target, to liberate Macedonia. Kresna uprising was helped by Sofian Committee "Edinstvo". But the target of the Bulgarians were to get the uprising for them and to conquer Macedonia. Normally the Macedonian leaders Dimitrija Pop Georgiev Berovski and Stojan Karastoilov didn't agree wit that. So they threw out the Russians. But that wasn't good for the Bulgarian goals. 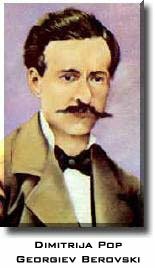 Because of this Stojan Karastoilov was killed by the Tatars (Bulgarians) and Dimitrija Pop Georiev Berovski was taken to prison. And with no leaders here is the end of the uprising. The metropolitan Natanail Kučevūiki, on June 6th 1879 ordered the troops to stop with uprising activity and the weapons to be put in warehouses. Important is to know that Kresna uprising uprising wasn't stopped by the Ottoman Turks. Bulgarians may claim today that, Kresna uprising was Buglarian riot.